Travel forms are documents that help in sorting out the various formalities and procedures related to travel. 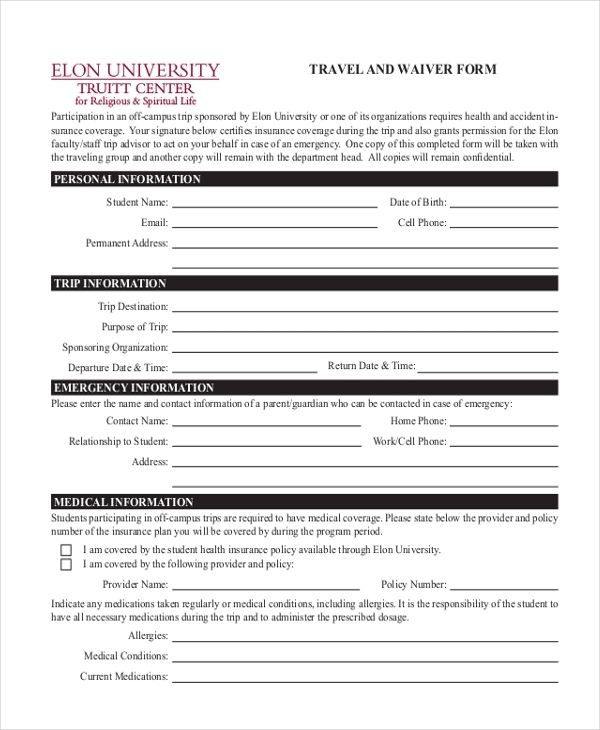 There are a large number of travel forms and their format and style can vary based on the reason for which these may be used. The best thing about using these forms is that since they are pre-designed the user does not have to worry about the right format or jargon. All he needs to do is fill in the relevant details. 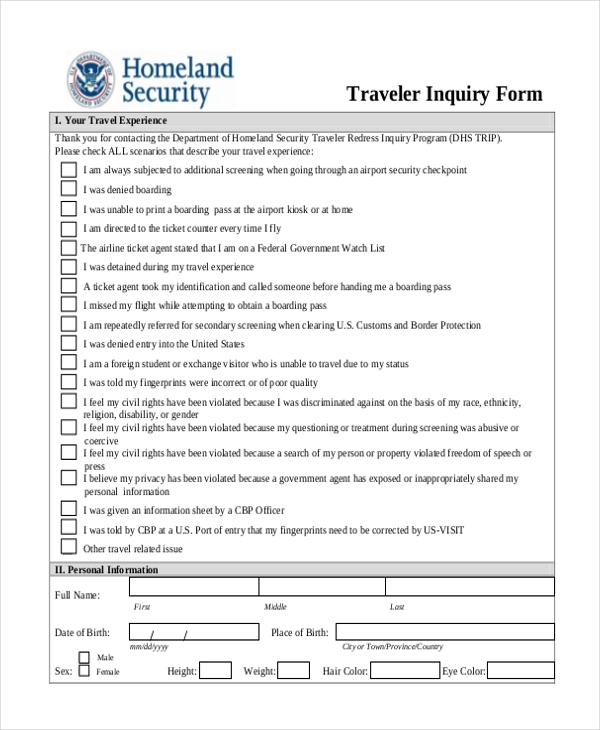 When a person working with an organization is required to travel for the purpose of his work, the organization expects him to fill in this form to get the required authorization for the travel. This comes in handy when the person may want to claim an advance or to get the travel expenses cleared. Going on a tour usually, involves major expenses. However, if you want to keep an eye on the amount of money that you spend then using this form can surely help. Filling in your expenses in this form will help you to keep a tab on your expenditure and to ensure that you do not go over budget. This form is used by a sports club to secure consent from the parents of the students to let them travel for a sporting event. In the form, the authorities should fill in the travel details and any other information that may be important. 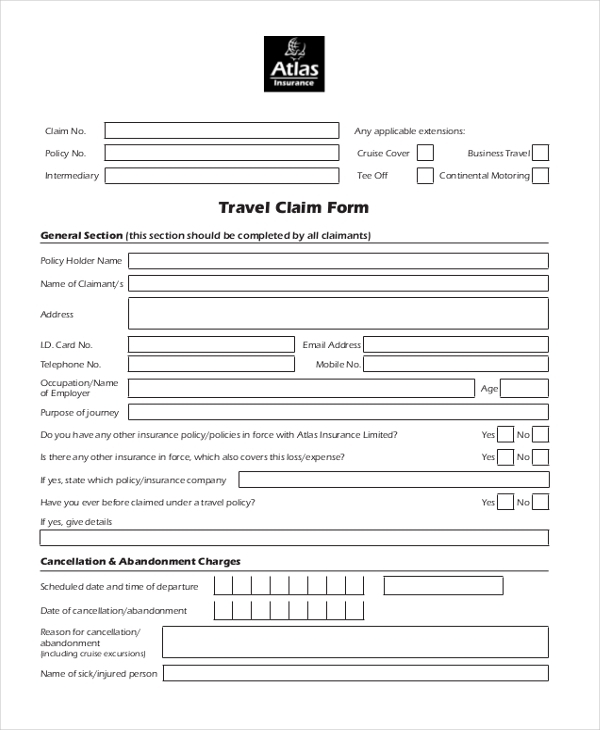 Insurance companies use this form to enable a person to apply for travel insurance. In this form, the applicant is required to declare all his personal details and health conditions. 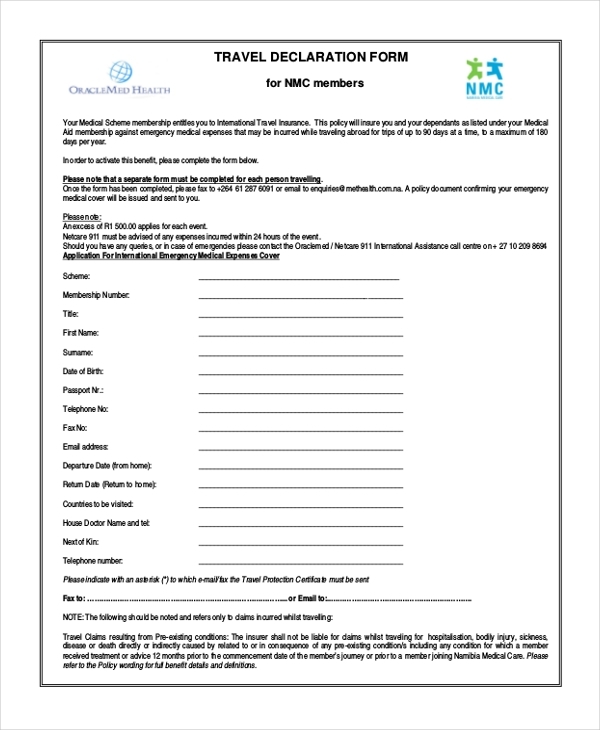 Business organizations use this form to help their employees to get a reimbursement of the expenses that they may have incurred when traveling for official purposes. 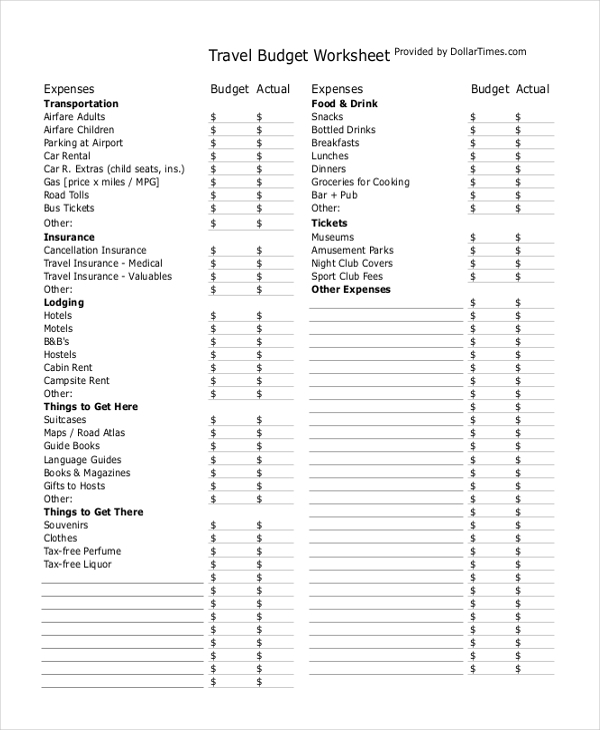 The employee is required to fill in the details of his expenses in this travel expense sheet and submit it with the bills attached. This form is used by travel agencies and tour operators. They hand over these forms to the customers who may be interested in planning a travel with them. The customer should fill in his personal details as well as the information about the place he wants to travel to. 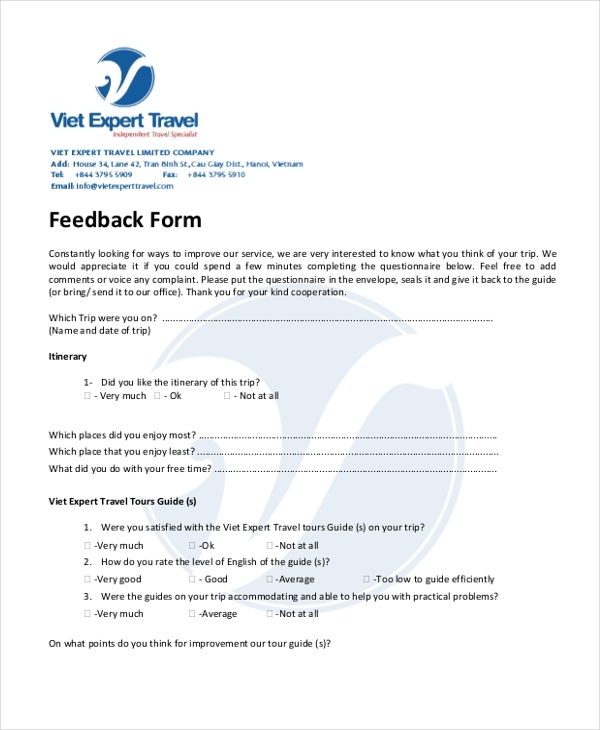 Tour operators and travel agencies use this form to get a feedback from their clients about the tour experience that they had. Assessing this form gives them an idea about what the clients think of their services and how they can improve these further. 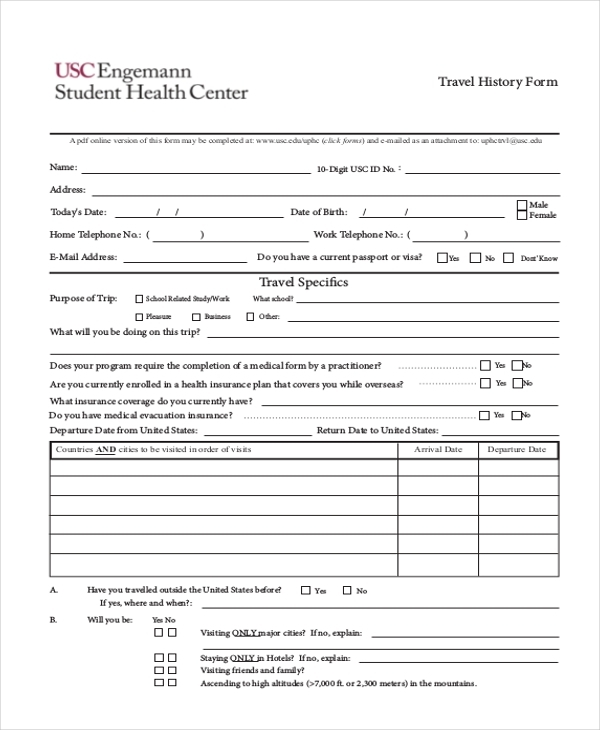 This form is usually used by educational institutions that may be involved in sending their students on travel. They use this form to get detailed information about these students like their medical history, food allergies etc. Before a person sets out on an adventure tour, he is required to fill in this form with his health details. This form comes in handy in case of an emergency. When an educational institution plans a travel with its students, the consent of the parents is necessary. It is for this purpose that the aforesaid form is used. The parents are required to fill in the details of their child in the form and then sign it to give their consent. 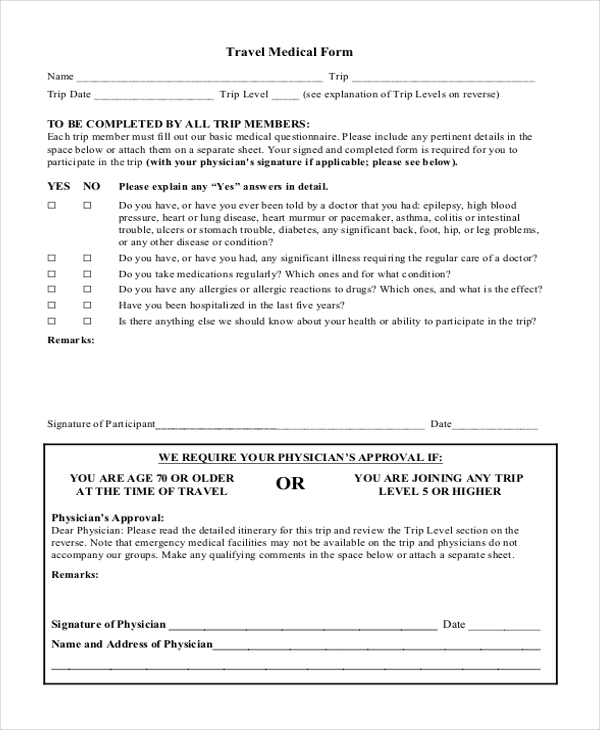 A person embarking on a travel with a group is asked to fill in this form. As the name indicates, the form is used to collect the medical details of the person which may be useful in case of an unforeseen event. This form is used by travel agencies and car rental agencies to keep a track of the track of the distance covered by their vehicles in course of a travel. 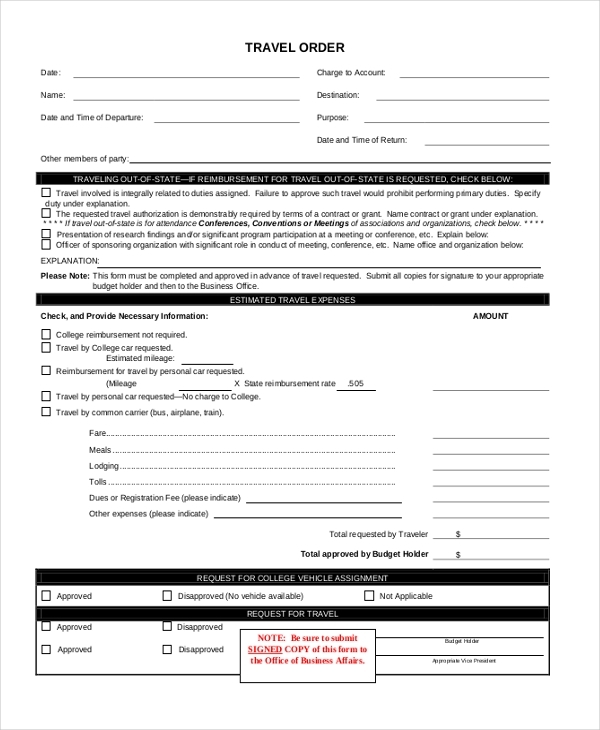 Educational institutions use this form to gain the consent of the parents of their students for a travel. In the form, the parents are required to fill in all the relevant details along with any special instruction that they may have. 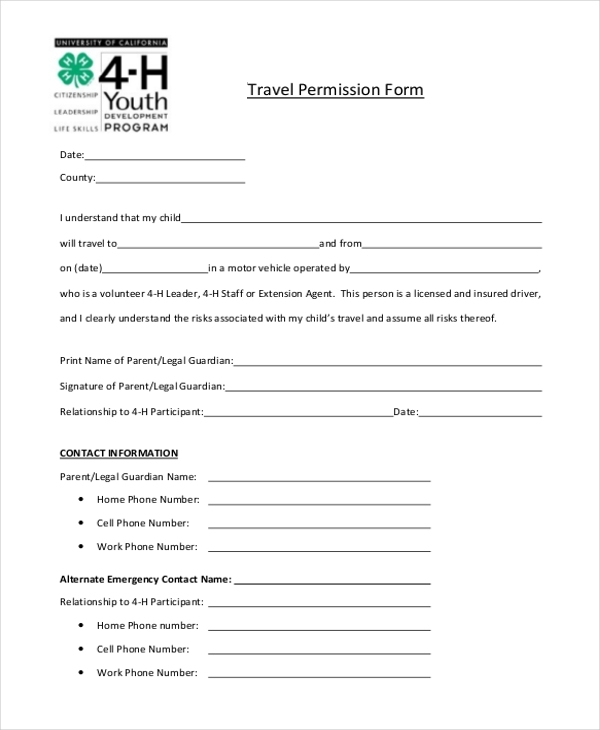 When a school or college plans a travel with the students in tow, the authorities seek the permission for travel from the students’ parents using this form. 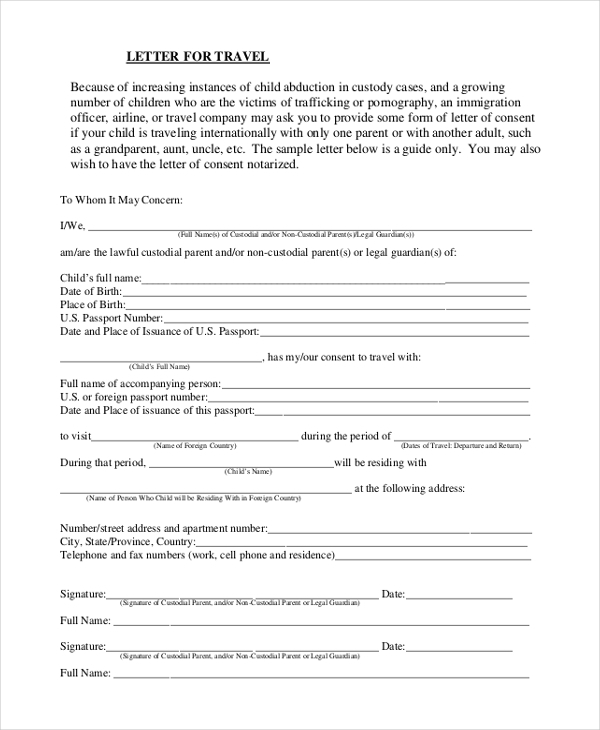 By signing the form the parents consent to the travel. When an educational institution plans a tour for the students, it can use the aforesaid form to request the parents for permission. In this form, the details of the travel are provided. 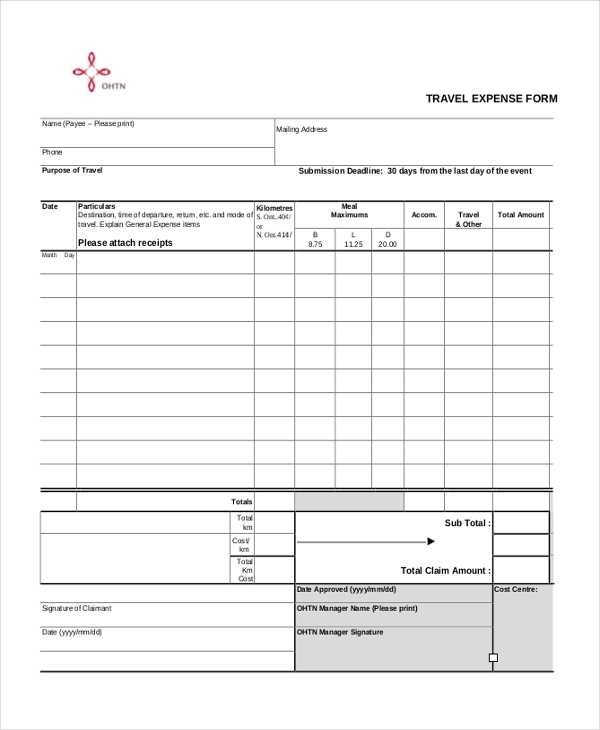 Business organizations use this form to allow their employees to claim a reimbursement for the expenses they may have incurred while traveling for the company needs. In this business expense form, the employee is required to fill in the details of the expenses and the form should be submitted with the related bills. 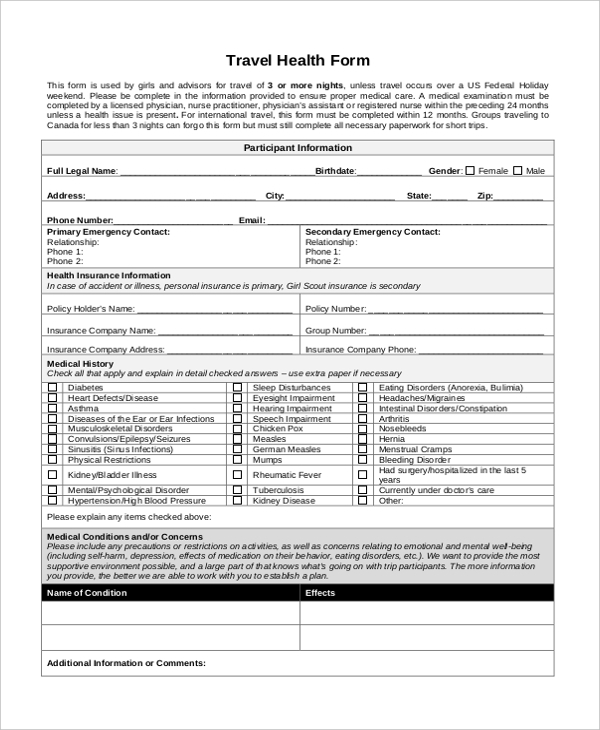 This form is used by a university or educational institution to ensure that when their student travels involuntarily for a project, they are in no way held responsible in case of an untoward incident. During a business travel, a person may incur certain expenses. However, he can reclaim these from his company. It is for this purpose that the aforesaid form is used. In the form, he can list the details of the expenses that he may have incurred during the travel. When a person travels for business purposes but has to incur certain expenses from his personal money, the company offers him a provision to reclaim this back. It is for this purpose that the business travel form is used. What are The Benefits of Using Travel Forms? 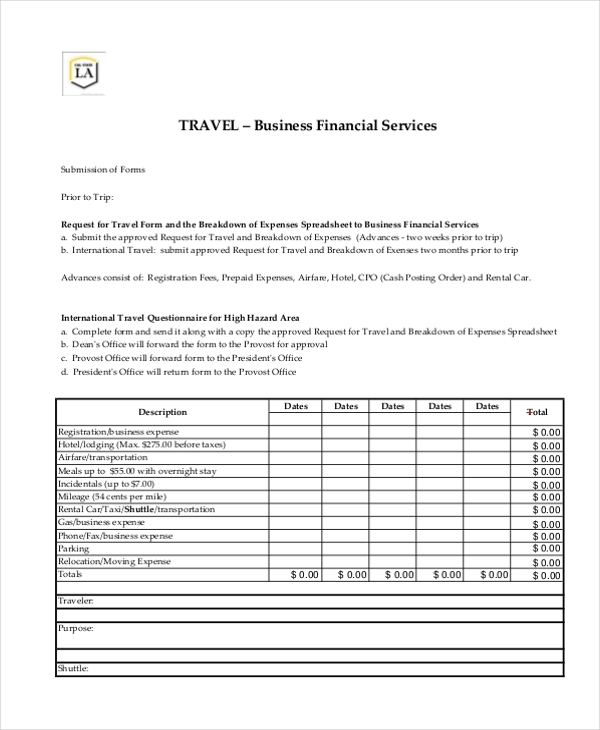 Need some help to design travel forms for your firm? Don’t worry. We have a wide range of these forms to offer. Pick the one that is perfect for you and download it. 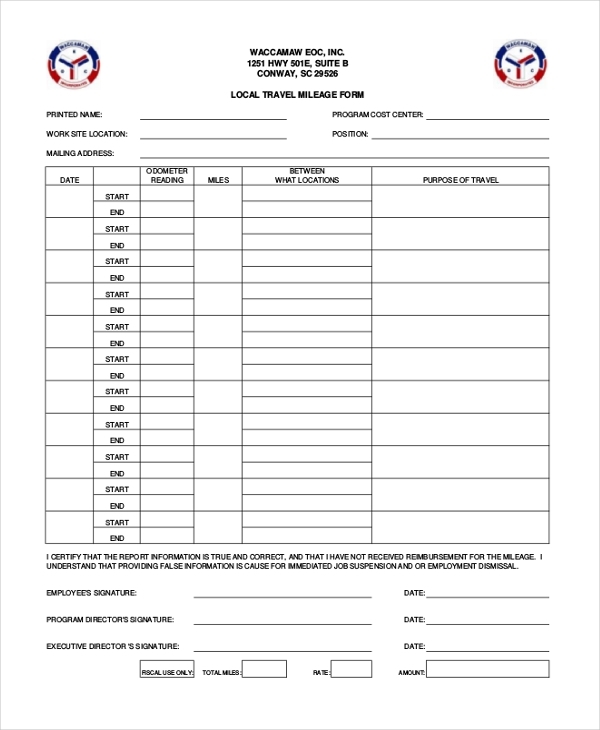 Customize the form as per your requirement and then print it out. These forms are available in MS Word and PDF formats.